THE Ministry of Environment and Forests (MoEF) has cleared the diversion of 636 hectares of pristine forest in Saranda, Jharkhand, for mining iron ore. On January 17, the Forest Advisory Committee (FAC) which approves dive - r sion of forests for projects, not only allowed Steel Authority of India Limited (SAIL) to renew an old lease of 808 hectares (ha) but also gave it permission to divert additional forest area. This approval goes against the MoEF order of 2009, where it mandated SAIL to prepare a wildlife management plan (WMP) before permission for expansion beyond 808 ha. This iron ore mine in Gua has been with SAIL since the 1940s. Its lease expired in 2009 and to renew the lease forest clearance was sought from MoEF. Along with the renewal, SAIL also told MoEF that it wanted to add another 275 ha to the existing mine lease. While MoEF gave a temporary approval of one year to the 808 ha, it kept on hold the expansion and instead sought a WMP from the steel behemoth. The lease has been temporarily renewed three times since—in 2010, 2011 and 2012—even though WMP was not submitted, as the minutes of the FAC meetings show. In 2012 it also allowed SAIL to begin expansion in 275 ha. The next year, SAIL told MoEF that it wanted to expand more and add another 351 ha, taking the total expansion to 636 ha. But even without the WMP, on January 17 the FAC cleared the original lease and the 636 ha of expansion for the next 20 years. As the minutes show, the SAIL project was cleared because of pressure from the Cabinet Committee on Investments. The project is purported to bring investments worth Rs.4,700 crore into the region. There are about 40 different companies mining within the Saranda forests and this was the reason a WMP was sought. The area also has rich for e sts and is an important elep hant habitat. The minutes of a meeting held between the Jharkhand government and the Union Ministry of Iron and Steel show that a draft WMP has been prepared by SAIL. But the Jharkhand Forest Department is yet to complete the mapping of the area to mark out the “inviolate” areas. This term is not scientifically defined, but is loosely used by MoEF to denote pristine forests with rich biodiversity. While an official of the Jharkhand forest department says that the term is vague, it was only in December 2013, almost four years after a WMP was sought, that it wrote to MoEF seeking the definition for “inviolate” area. It is yet to receive a reply. 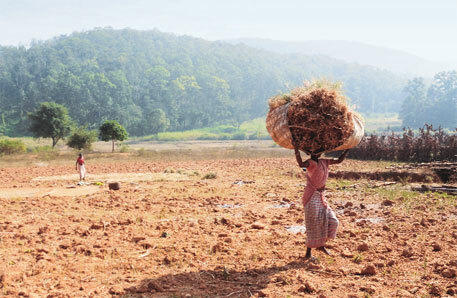 As per SAIL’s proposal, around 40,000 tress will be felled once mining expands to the entire forest area. Out of these, 26,000 trees have girth of above 70 cm indicating a healthy forest, say experts. According to the report of an expert committee appointed by the Jharkhand government in 2011, one of the negative impacts of felling of tress has been the heavy erosion of soil along the banks of the Karo and Koel rivers which are situated next to the mines. The expert committee included D S Srivastava, principle investigator with the Jharkhand forest department, and P S Easa, a wildlife expert and retired director of the Kerala Forest Research Institute. The committee was appointed to prepare a comprehensive management plan for Saranda forest. Srivastava says 480 new species of flora and fauna, including three frog species, have been identified in the forest by the committee. The findings have been reported to the Zoo logical Survey of India and the Botanical Survey of India for classification. SAIL, too, admitted in its mining proposal that the forests form the core of Singhbhum Elephant Reserve, which led experts such as Srivastava to believe that a wildlife management plan should have been the first priority. SAIL says it has been given a target by the Union Ministry of Steel to increase production to 50 million tonnes by 2025. In 2012-13 the output was 17.5 mil lion tonnes. SAIL needs to double its supply of raw materials to 40 million tonnes a year. Gua mine will meet 25 per cent of its iron ore needs once mining operations are expanded to the entire forest area. it is a tragedy that the pristine forest is being sacrificed at the altar of development . In India forget about wildlife management plan the so called afforestation is just planting of euclyptus earlier now subababul or such types of plants monoculture to replace a forest with wide variety of flora and fauna .